Fine of 10/- imposed Friday 16th July 1915 for allowing brightly lit windows, which could attract Zeppelin airship bombers. Edward Barcham accused John King of excessive horse-hire and damages to the horse at the Petty Sessions Wednesday 9th December 1863. Mr. King, a timber merchant had hired a horse on the 4th November to go to Elmham, a distance of 5 miles; whereas he went to Thursford, a distance of 18 miles. Judgement was given for the extra mileage, and the estimated damage done to the horse, for which immediate settlement was ordered. According to the Churchwardens accounts of 1753, £3/14/0d was spent on food and drink while `perambulating the bounds'. A meeting here in 1774 attracted over 500 people. The purpose was to consider the application for an Act of Parliament to build a workhouse for the Mitford & Launditch Hundreds. Although the proposal was rejected by a large majority, the Act was passed. The Directors of the Poor of the Hundreds of Mitford met a the George Inn on 25th March 1776 to discuss their plans to build a House of Industry at Gressenhall. The reason James Moore was leaving the George was because they appointed him the first Governor of the Workhouse and his initials and date are inscribed on a brick beside the entrance door to the workhouse. As a result of the Poor Law Amendment Act 1834, the house of industry was adapted to become the Mitford & Launditch Union Workhouse. Now it houses the Norfolk Rural Life Museum known as `Roots of Gressenhall'. At the George in East Dereham the 18th Day of this Instant July, between the Hours of three and Five in the Afternoon if not before disposed of by private Contract of which notice will be given in this Paper. A Capital MESSUAGE in East Dereham wherein James Moore now lives, and called or known by the name or Sign of the George; consisting of three good Parlours, a very handsome and large dining Room, two good kitchens, with scullery, pantry and other convenient offices adjoining; a good and commodious Bar, Cellars, good Vaults, eight Chambers and five Garrets with a Brewhouse, Stable for fifty horses, Coach-house, Granary and other convenient outhouses all Brick and tiled, in very good Repair with a large and pleasant Bowling Green and Garden planted round with flowering shrubs; all Freehold. The Purchaser to take the Household Goods, Furniture, Horses, Chaises and other Stock upon a fair appraisement. For further particulars apply to the said Mr Moore or Mr Thomas Smyth, Attorney at Dereham. For sale, Freehold, December 1777. The Owner being lately promoted to publick Office of the greatest Trust and was the only Reason he left it. Offered for sale by auction June 1786 with possession Michaelmas 1786. Sale included a Hearse and two Post-Chaises which were fully employed. According to the Universal British Directory 1793 - 1798 the George Inn had previously been in premises that were lately the shop of Mr Knapp. 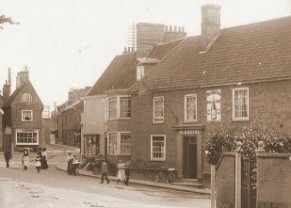 It went on to advise that for the past 25 years `there has been a justice-sitting consultancy held at the George Inn, on every Friday (Market Day), which by experience has been found to contribute much to the public in every respect ....'. George Inn, East Dereham: Thomas Barker (from Scole Inn) having entered the above Inn, respectfully acquaints his friends and the Public that he has laid in a large stock of wines and other Liquors of the first quality which he purposes selling wholesale and retail on the lowest terms, the nobility, gentry and public at large may be assured of meeting with every accommodation and of having a minute and unremitting attention paid to their commands. T.B. also begs leave to assure all Gentlemen Travellers who will favour him with their support that his utmost endeavours shall ever be exerted to merit their future patronage in rendering them every accommodation. Neat Post Chaises with Able Horses and Steady Drivers on the shortest notice. It was advertised 5th October 1793 that the Mercury Post Coach would set out from the house of Mr. Barber, every Monday, Wednesday and Friday morning at Three o'clock. It would arrive in London in the early evening. Fares of £1 1s from Dereham with Outsides at half price. This was the only coach travelling from Norfolk to London by Day. For Sale by Auction Friday 25th March 1814. With excellent Stabling and Bowling Green. In occupation of Joshua Mayston, as tenant from year to year. Robert Clarke advised His Friends, Gentlemen Travellers and others that he had taken the Inn - October 1815. Neat Post Chaises and good Horses, with careful Drivers could be provided at the shortest Notice. The GEORGE INN was to be Sold by Auction Monday 21st April 1817, with Immediate Possession. Part of the George Inn was sold at the premises, on Tuesday 10th July 1817. The Freehold Estate previously forming part of the Inn consisted of an Entrance Hall, three rooms fronting the Market place on the ground floor, four good chambers, three attics, a very large and convenient dry cellar and a spacious yard with convenient outhouses. Four other lots consisted of parcels of rich freehold land contained within an area of about 141 feet by 38 feet adjoining the above. The purchasers of these lots were to erect a seven foot wall, nine inches thick, between each lot, within three months of purchase. Part of this land had formed part of the Bowling Green and was a very desirable spot for building. Being situated near the site of the proposed navigable river from Dereham to Wells they would be well worth the attention of a Corn or Coal Merchant. and as the GEORGE INN at Market Hill 1836. The Opening Dinner for Mr. J. Ives was to be held Friday 29th May 1840. He was already impressed with Gratitude for the many Favours already conferred. Tickets at 10s each were to be had at the Bar. The bowling green was reputed to be over 300 years old, one of the oldest in England - when tarmac surface laid over it during 1986 (? ), to allow car parking.